The AirVisual monitors provided by Unioil are state-of-the-art air quality monitoring instruments that use laser sensors to measure hazardous particulate matter down to 2.5 micrometers size (PM2.5). It also uses the latest technology like big data, artificial intelligence, and the internet to provide a visual image of air quality in the Philippines to millions of people through an air quality mobile app. 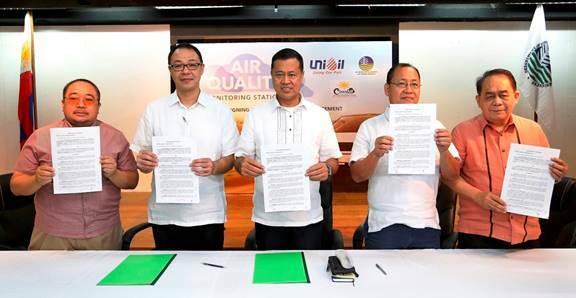 During the ceremony, the Clean Air Philippines Movement, Inc., a strong advocate of clean air in the Philippines, also awarded Unioil as its first corporate clean air champion. This is in recognition of Unioil’s initiatives of introducing cleaner fuels, such as Euro 5, the launching of the first solar-powered gas station and electric vehicle charging station, and the deployment of air quality monitoring stations in the Philippines. Unioil president Kenneth Pundanera (right) and DENR-EMB Air Quality Management Section Chief Engr. 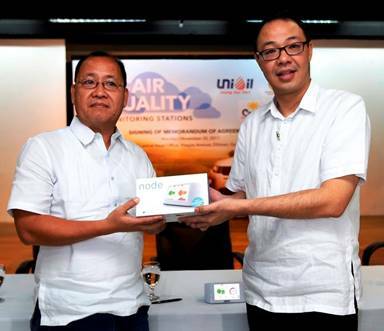 Gerry Capulong presents one of the AirVisual nodes that will be installed in Unioil stations to monitor and transmit live data on air quality.